Wash and dry potatoes. Bake on middle rack of oven until tender (about 50-60 minutes). Remove from oven and cool just until they can be safely handled; cut in half lengthwise. Scoop the insides of the potatoes into a large bowl, taking care to leave the skins intact. Add milk, cream cheese, half the Cheddar cheese, green onions, salt, pepper, smoked paprika and the oregano; mash together until well mixed. Stir in the chicken and half the bacon. Fill each potato skin with an equal amount of the potato and chicken mixture. 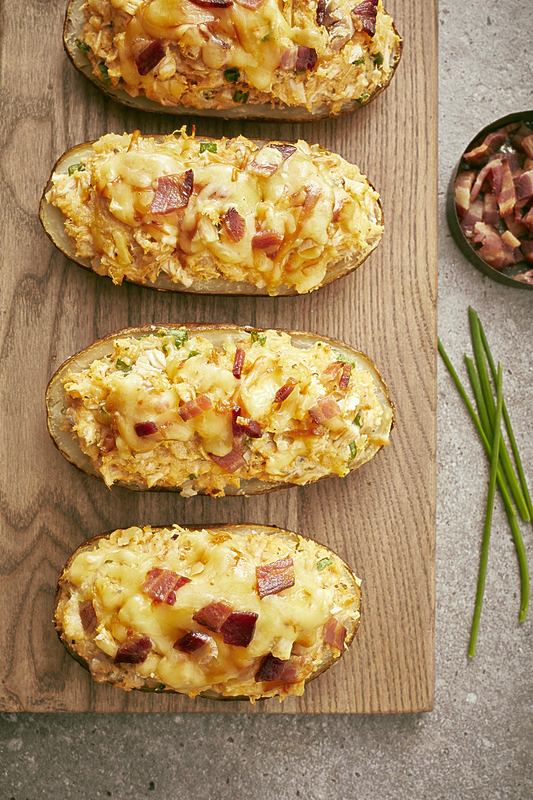 Top each stuffed potato with the remaining cheese and bacon. Place stuffed potatoes on a baking sheet and bake at 400F for 20 min. or until cheese is melted and bubbly. Tip: Bake the potatoes and make the potato chicken mixture ahead of time; refrigerate until ready to stuff the potato skins. The stuffed potatoes may need an extra 5-10 minutes of baking to melt the cheese. Variation: substitute small sweet potatoes for the baker potatoes.